Our paper, published today in Nature Communications, provides new insights into the nature and timeline of environmental catastrophes that formed the end-Permian extinction, in the high southern paleo-latitudes. Our paper, published today in Nature Communications, provides new insights into the complexity and pacing of the devastating end-Permian biotic crisis, often called “The Great Dying”, in which up to 96% of marine species and 70% of terrestrial vertebrates became extinct. Our team investigated stratigraphic sections of the Permo-Triassic boundary interval in New South Wales (NSW), Australia, to show that the terrestrial flora underwent complete turnover some 370,000 years before the known age of the main marine extinction event as established by Burgess and others (2014). Recent research has hinted at a complex series of events around the end-Permian, but ours is the first study to establish directly the timing of the floral extinction relative to that of the marine extinction event and the Permo-Triassic boundary (251.9 million years ago). 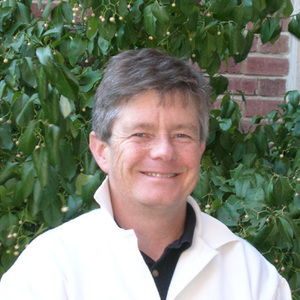 This research has been possible because of the diverse group of collaborators who pooled their expertise in stratigraphy, sedimentology, paleobotany, palynology, geochronology, geochemistry, and paleoclimate modelling to holistically evaluate the end-Permian extinction in the high southern paleolatitudes. Perhaps unusually, three married couples are among the senior investigators of this project – Cornelia and Arne Winguth (climate modelling), Vivi Vajda and Steve McLoughlin (palynology and paleobotany), and Tracy Frank and Chris Fielding (geochemistry and sedimentology). We studied surface exposures of the Permo-Triassic boundary interval in coastal cliffs north and south of Sydney, NSW, and continuous drillcores through the same section held at the NSW government’s geological data centre in Londonderry, western Sydney. We benefitted from the immense archive of geological samples acquired over 200 years of exploration for, and mining of, coal and natural gas in the Sydney Basin. The group at the core library in Londonderry, western Sydney (from left, Malcolm Bocking, Bob Nicoll, Vivi Vajda, Chris Fielding, Tracy Frank, Steve McLoughlin). Photo credit: Mark Ryland. The scientific consensus is that the end-Permian extinction was triggered by intrusion and extrusion of large volumes of basaltic lava in the Siberian Traps Large Igneous Province. Previous work has called for profound paleoenvironmental changes across the Permo-Triassic boundary in the continental realm, including devegetation, catastrophic erosion of landscapes, changes in depositional environments and patterns of sedimentation, and an abrupt trend towards more arid environments. Climate models and geochemical data call for large increases in surface temperatures, in CO2 concentrations, and in seasonality of precipitation. In the Southern Hemisphere supercontinent of Gondwana, coal seams are abundantly preserved up to the end-Permian, then disappear for millions of years. We pinpointed the extinction of the well-known Glossopteris flora at a horizon a short distance above the top of the uppermost coal seam, at about 252.31 Ma. In contrast to prior studies, however, we saw no evidence for a major reorganization of the depositional setting, no abrupt drying trend, and only local evidence for soil erosion at the turnover horizon. Our observations suggest that perturbations in temperature and moisture availability may have been short-lived and muted in the high southern paleolatitudes, relative to more equatorial locations, as predicted by climate models. 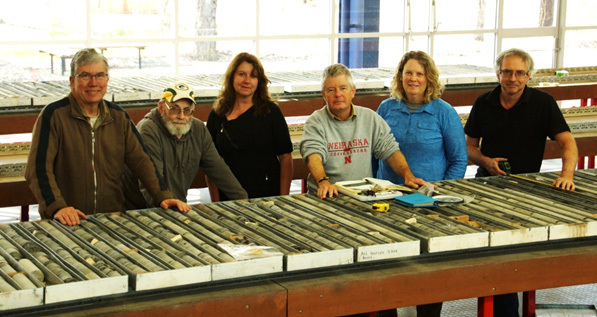 Our geochemical investigations identified a spike in nickel concentrations, an anomaly also noted by other researchers at comparable stratigraphic levels. Coincidences between the location of the anomaly and the floral extinction suggest that they may be causally related and that heavy metals (transported as aerosols from Siberia) may have contributed to the floral turnover. Although local paleoenvironmental changes were muted, the far-field effect of aerosol-borne toxins may nonetheless have been devastating. It is now tempting to speculate on the series of unfortunate events that might have occurred in the high southern paleolatitudes around the Permo-Triassic boundary. Evidently, the terrestrial flora was the first ecosystem to collapse. This would have had a profound effect on herbivores, which logically would have become extinct in significant numbers some time later. There would then have been a domino effect on carnivores, once the herbivores became less available as food sources. Finally, as the toxins and other products of environmental degradation were flushed into the world’s oceans, combined with elevated CO2, surface temperatures, and other stressors, the “main event” killed the majority of life in the marine realm. It makes a sorry tale. Of course, it couldn’t happen again, could it? 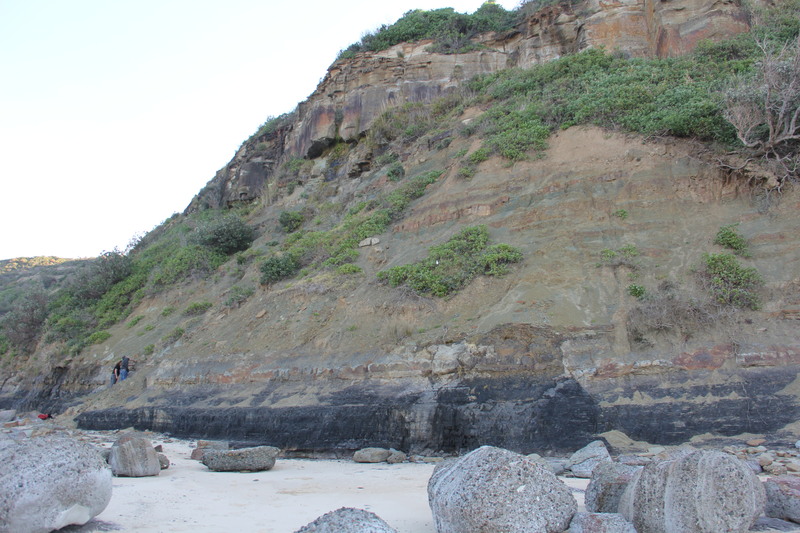 Vivi and Steve examining the outcrop section at Frazer Beach, in the Munmorah State Recreation Area, Australia. The uppermost coal seam is visible at the foot of the cliff, with the floral turnover event recorded a short distance above that. Photo credit: Chris Fielding.